COUNTRY LOG CABIN: 2018 SCRAP ATTACK! 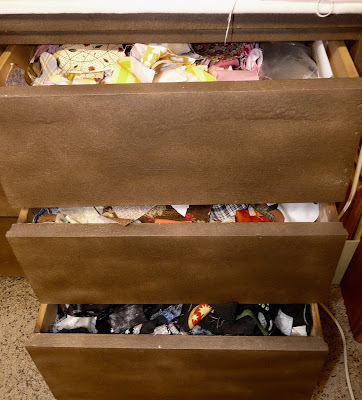 I admit that I have a scrap problem. 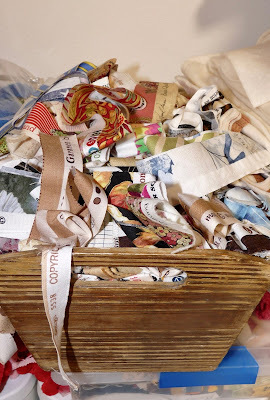 As you can see, I have joined the "SCRAP ATTACK" group started by Sarah at Confessions of a Fabric Addict. Since I had already decided that I needed to use up a lot of scraps this year, I decided to join. I had to put 12 goals on individual pieces of paper, one for each month, and then draw one each month. I just drew the one for January and its - "Use men's shirt scraps and plaids to make a donation quilt. Uh Oh! That's not the one I wanted to work on this month. But I could at least come up with an idea and start it. Here are some photos of my "problems." This is embarrassing! I didn't even take a picture of the large bin full of men's shirts and I'm sure there are others as well. 1. 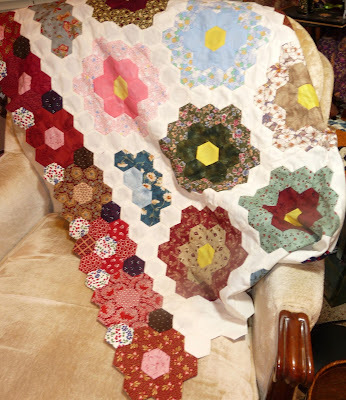 Abby's Bodacious Quilt - I want to get this finished for Christmas 2018. I have about 10 blocks done. 2. American Cross Roads (blocks are done). 3. Merry Trails Wall Hanging (Quilt Mania). 4. Moda Block Heads - finish and put together. 6. Blocks my Grandma made in the 40's - put together, quilt and bind. 7. Cat quilt - pieces are cut. 8. Verandah Views, which was a block of the month from Willowberry Designs, 2009. 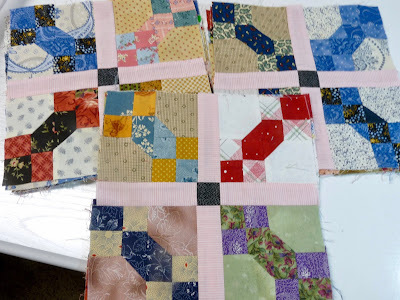 All the embroidery blocks are done and need to be put together into a quilt. 9. Grandma's Flower Garden that I started at least 10 years ago. After making several blocks, I decided to turn it into a lap quilt. It wasn't working out very well, so I stopped working on it. I want to get it finished one way or another. 10. Another block of the month, which I can't find, was basket blocks for each month. It's really cute and I finished about 8 or 9 of them. I would like to get the rest finished. Do you think that is enough? If not, I may be able to come up with a few more. Ugh!! My design wall has some log cabin blocks on it that I want to make into a table runner. The blocks measure 5 1/4" unfinished. They aren't sewn together yet. Well, please wish me luck with these projects. I plan to use scraps in my UFO projects, so I might reduce my stash some if I only purchase fabric that is absolutely necessary to finish a project. Have you made any goals or joined any group for 2018? Let's all work together to use up scraps and stash!! I don't see any problem with your scraps. Looks like my house lol. I'm always using mine and they never seem to go down. You DO have a lot of scraps! Of course, I probably have almost as many---stuffed somewhere; God only knows where! 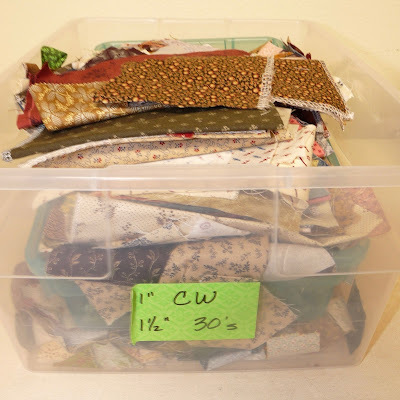 Working with scraps is really a challenge for me, but I'm going to try a bit this year. However, I do really miss just cutting into new and pretty fabric, that measures full width! I have probably a lot more of that than I have scraps. I keep thinking, why work with scraps when I could cut into this pretty fabric I bought probably 10 yrs. ago? Challenges, Decisions, and Persistence! I think that's what 2018 will require of me! I just hope I get more done this year than I did last year. I have no doubt you'll reduce your scraps a lot! Oh, and I love your Dear Jane blog header. It is gorgeous! ---"Love"
Oh dear, I know exactly how you feel. Take comfort in that there are many of us all trying to do the same, lol. I have a list too. Good luck with your shirt blocks. No Problem ! .... Looks like fun. I have to save everything - just never know when you might need it. 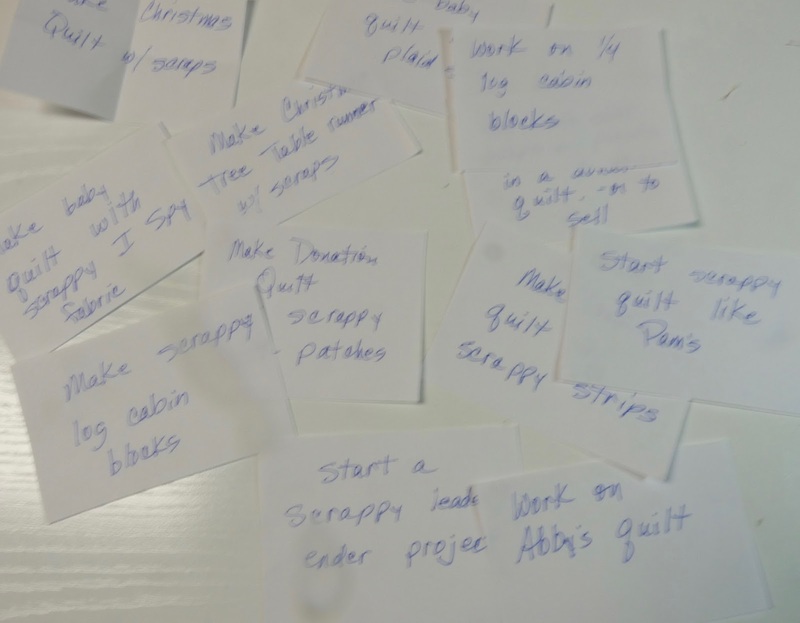 You do have a lot of scraps. I keep mine for a while & use them for applique pieces. Then I cull some of them out and donate them to the church thrift store. I do that when I get tired of using the same scraps over and over. 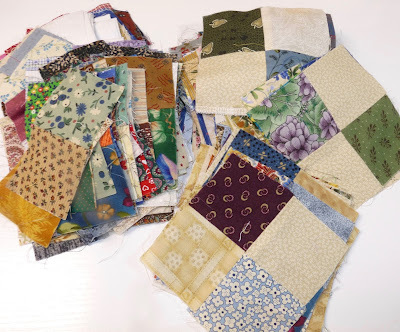 wow that really is a lot fo scraps - have fun making quilts with them! Good luck! I'll happily follow your progress this year! 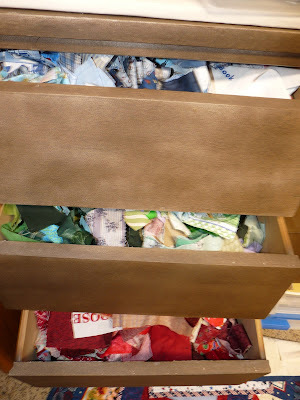 Almost all of my quilts are scraps! 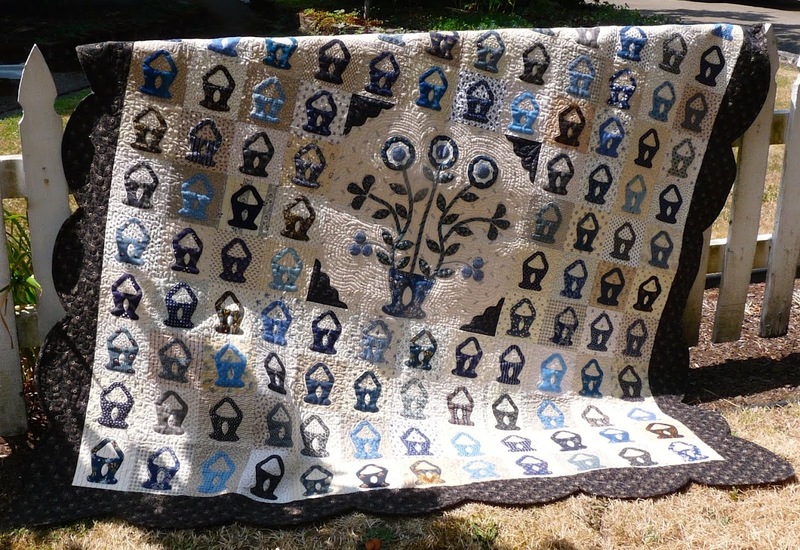 Oh my, your Dear Jane quilt is gorgeous! Just a few scraps there and lots of good projects on the list. Good luck Ruth - if anyone can make a dent in that list it will be you. We get to enjoy your progress along the way! Your Dear Jane quilt is beautiful. WOW! 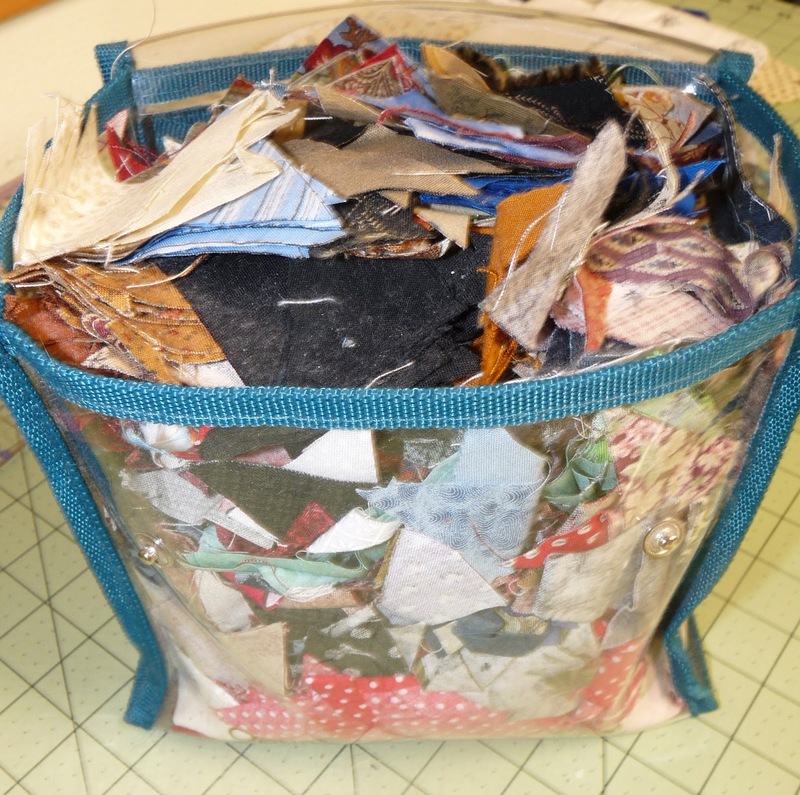 Yes, you do have a lot of scraps. 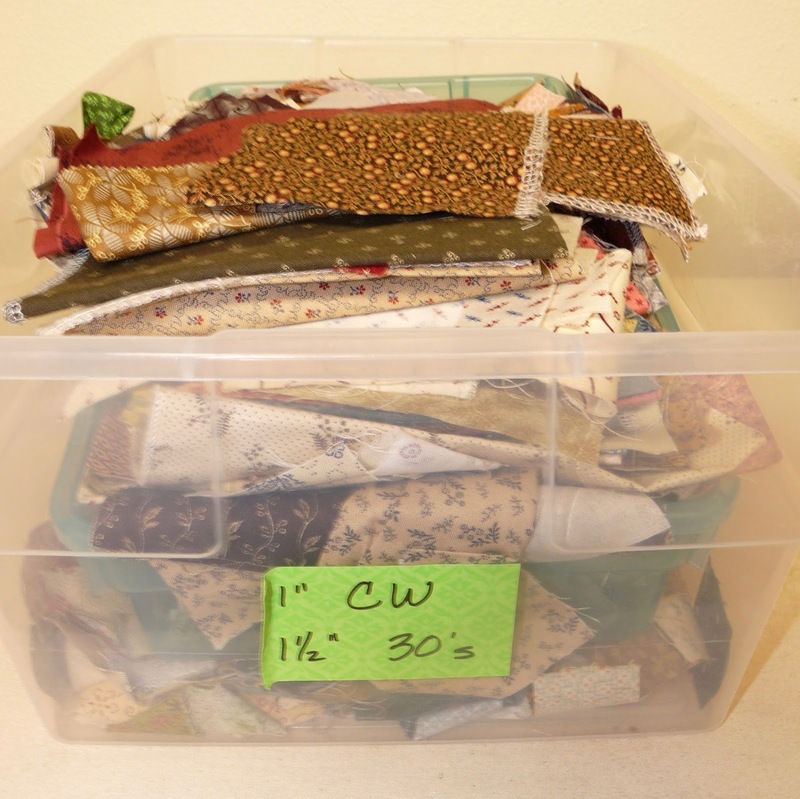 I don't have that many since I made a log cabin quilt a few years ago and that used up lots of them. Good luck in reducing your scraps. 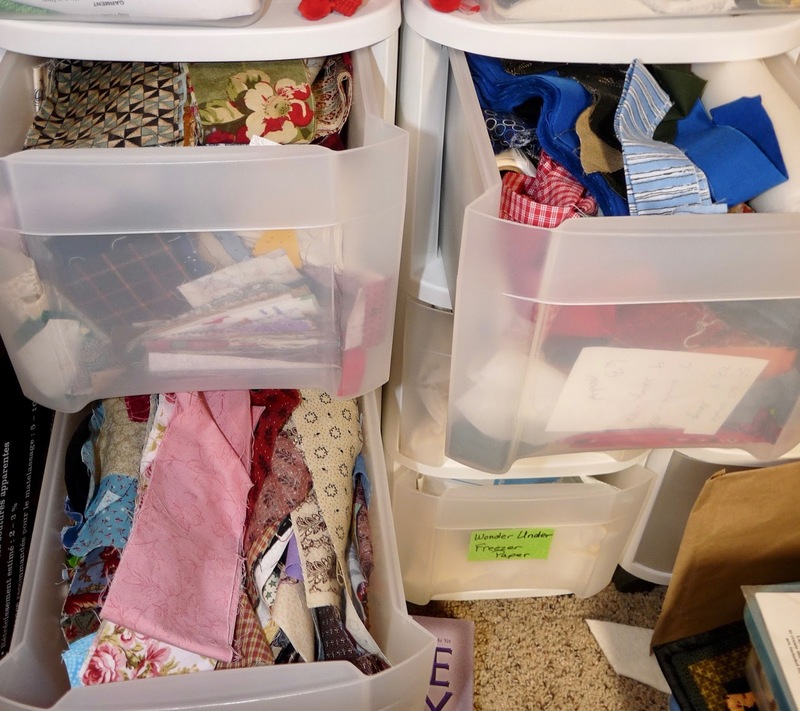 If you don't have a lot of scraps, how can you possibly make lots of quilts? I love scraps. 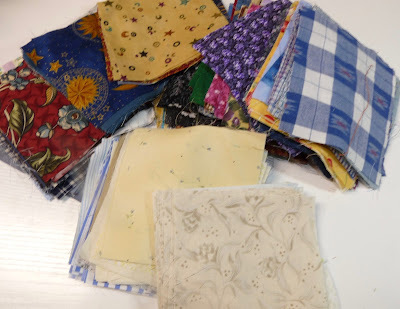 The only problem for me, is getting them sorted, but when I want to start a quilt, it's great knowing I have lots of scraps to pick from. Hope you get some of your UFO goals finished. I think you are in for a fun year.